Set in Toronto, circa 1895-1901, and featuring a clever police inspector who often invents techniques to fight crime, this long-running skein is a real treat. Detective Inspector William Murdoch devises forensic techniques that were radical for the time. 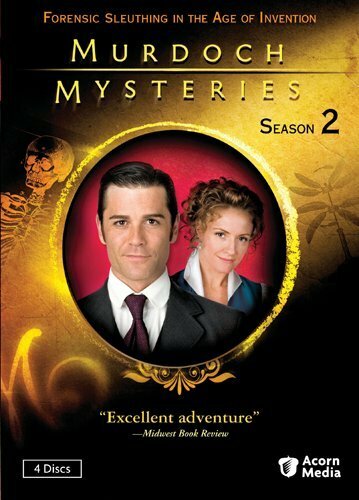 Originally titled “Murdoch Mysteries,” but currently called “The Artful Detective,” on the Ovation cable channel, this turn-of-the century police inspector series is great fun, not only for the clever crime cases but because its plots weave in famous historical figures. In some of its 112 episodes over eight seasons (airing 2008-2015 — 103 of which had been shown in the U.S. as of October 2014 — we met Arthur Conan Doyle, Buffalo Bill Cody, Harry Houdini, Nikola Tesla, Thomas Edison, Emma Goldman, Henry Ford, Winston Churchill, Annie Oakley, H G Wells, Jack London, Queen Victoria, Orville and Wilbur Wright, Henry Ford, and possibly the real Jack the Ripper. Currently Netflix Instant streaming offers us three seasons of 39 episodes, and many others are on YouTube, including this one. In the 1890s, Toronto Constabulatory Detective Inspector William Murdoch devises and uses forensic techniques that were radical for the time, including fingerprinting, lie detectors, blood testing, surveillance, and trace evidence, to solve some of the city’s most gruesome murders. Assisted by coroner and love interest Dr. Julia Ogden and Constable George Crabtree, and with the support of his somewhat doubtful superior Inspector Brackenreid, Murdoch solves a plethora of crimes. Episodes have fun 19th Century costumes, sets and appurtenances (characters travel by bicycle most of the time). 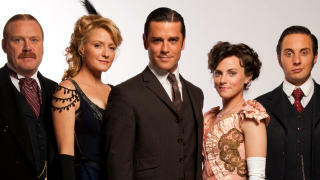 The series was created by Maureen Jennings, based on her Murdoch novels, and stars Yannick Bisson as Murdoch, Helene Joy as Dr. Ogden, Jonny Harris as Crabtree, and Thomas Craig as Chief Inspector Brackenreid. The popular series has won four major Canadian awards (three from Canada’s Writers’ Guild) and has garnered 32 other nominations, including nods for Craig, Harris, and several guest performers, and Monte Carlo International TV noms for Bisson and Joy. Set between 1895 and 1901 (so far), the series features anachronistic technology that Murdoch uses to improvise crude prototypes of technology used today. In one episode, for example, he creates a primitive version of sonar to locate a sunken ship in Lake Ontario. In another, he basically invents wiretapping. In yet another, a foreign police officer has a photograph which Murdoch needs as evidence, so Murdoch asks the other officer to overlay the photograph with a grid which is numerically coded for the color in each square, and then to transmit the numerical data to him via telegraph — with the end result that the officer has essentially sent Murdoch a fax. Brackenreid is a blunt and skeptical Yorkshireman with a fondness for whiskey, who prefers conventional methods of detection over Murdoch’s eccentric methods, though he is typically pleased and proud when Murdoch is successful despite the odds. 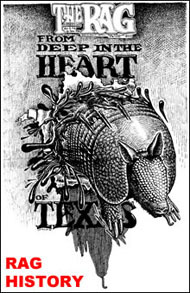 The inexperienced but eager Constable George Crabtree aspires to be a mystery-novel writer. Crabtree is often unable to grasp the more advanced methods, but his enthusiasm and loyalty make him a good assistant. Craig, Joy, Bisson, Reilly, and Harris. 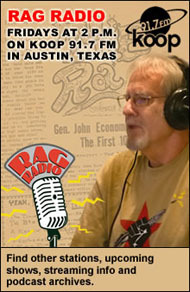 Like Crabtree, Dr. Ogden is a great supporter of Murdoch’s methods. Her skill in pathology usually helps by revealing a lot of useful evidence to aid Murdoch in solving cases. Throughout the series, Murdoch’s growing infatuation with her, and his inability to express his feelings, provide a light subplot. In the fifth season, after Dr. Ogden is married to Dr. Darcy Garland (a colleague she met in Buffalo), a new pathologist is introduced, Doctor Emily Grace (Georgina Reilly), and she and Crabtree show some romantic interest in each other. Real history is an important element in most episodes, and the plots, though fictitious, sometimes involve real people. Future events are often foreshadowed. For example, it is implied that secret British-American government cooperation has produced a highly advanced aircraft similar to an airship. Characters also refer to actual inventions of the 19th century and extrapolate from them to future inventions such as microwave ovens, night-vision goggles, computers, the games “Cluedo” (marketed as “Clue” in the U.S.) and “Hangman,” Silly Putty, and a silencer for small arms. Another underlying theme of the series involves the fact that Murdoch is a Roman Catholic in what was at the time a predominantly Protestant city, and the prejudices that he occasionally encounters as a result. The series airs internationally, including in Iran, Australia, Brazil, UK, Belgium, the Czech Republic, Denmark, France, Hong Kong, Hungary, Italy, Lithuania, Norway, Poland, Portugal, Russia, Singapore, Sweden, Thailand, Turkey, Catalonia (Spain), and South Korea. It is highly enjoyable for many reasons, including the fine writing, historical accuracy, and charming cast. 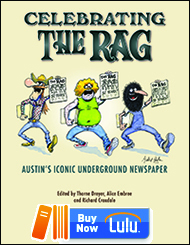 This entry was posted in RagBlog and tagged Alan Waldman, Canadian Television, Criticism, Murdoch Mysteries, Rag Bloggers, Television, The Artful Detective. Bookmark the permalink. I love the Dr. Emily Grace and Lillian Moss romance. Good women and introduced with class. I hope this storyline continues as so many women have long term relationships that are very fulfilling mentally and professionally and would like to see people they can enjoy watching and relate to, finally. Thank you so much to the writers and actors on this series. This is driving me crazy. Why is Georgina Reilly never listed in the opening credits? Her name appeared during the season Dr. Grace was first introduced, but since then, I can’t find her name anywhere. What gives? What is burning in the flame at opening of Artful Detective?